The Great London Authority (GLA) displaying the administrative boundaries of the 33 boroughs. 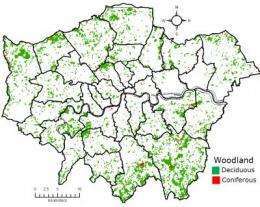 Urban woodlands are shown (extracted from the Land Cover Map 2000). 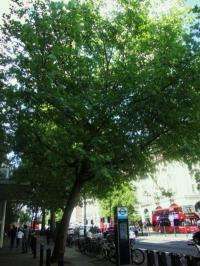 This woodland canopy comprises c. 8.6 percent of the whole GLA land area; the remaining c. 11.4 percent is made up from garden trees, street trees and undesignated individual trees. Credit: Fuller R, Smith GM, Sanderson JM, Hill RA, Thompson AG (2001). The UK Land Cover Map 2000: Construction of a parcel-based vector map from satellite images. Cartographic Journal, 39, 15-25.